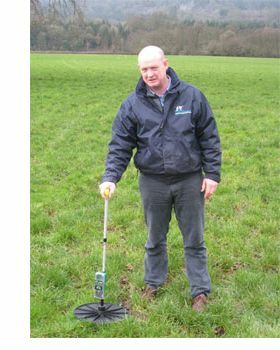 Our range of Platemeters provides a simple, yet effective method of measuring grass cover in grazing pasture. Especially popular with UK, Irish & European dairy, sheep and beef farmers, the platemeter for grass is able to operate in most weather conditions and this quality product is cost effective and reliable. Click here to find out why you need a Platemeter! Why You Need a Platemeter! The best solution to improving farm profitability is to produce more from what you can grow best at HOME– ie Grass. Your grass on your Farm is your Cheapest & most versatile feed. Effective management can increase your grass yields by 15-30%. Using a Platemeter to measure grass regularly, animals can be turned into and, as importantly, out of the fields at the right time, as per AHDB advice. This ensures you can avoid both over and under grazing - both of which can result in lower yields. Originating from low cost New Zealand Dairy farming, Platemeters are now well-established in the UK. They give an accurate weekly indication of grass available in KgDM/Ha (Kilograms of dry matter per hectare) for all grazing platforms, in which order to graze and which to conserve. F200, F300 and F400 Digital models come with FREE P-Plus Software for record keeping + the important Grazing Wedge. Historical data can also be viewed to determine how each paddock is performing and might be improved. With low Milk, Beef & Lamb prices, it’s essential to maximise your Own Farm Resources. Platemeters help you grow grass as a crop – like Maize/Wheat/Barley etc. 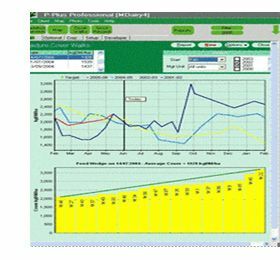 Platemeters measure average grass Height & Density, showing yield in KgDM/Ha. Sward Budgeting - To Plan Grazing availability ahead of time & make the most of grazed grass over the entire grazing season. Advisers indicate 15-30% efficiency improvements & much improved grassland management, improving feed cost budgeting & better fertiliser placement. Grazed grass is the cheapest form of forage & the key to improving profitability in any Livestock enterprise. We export to All EU Countries - including Eire, France, Germany, Belgium, Holland, Spain, Portugal, Switzerland, Scandanavia etc. Export to Other Countries also welcome Carriage Cost to all Countries is by Quotation. The Platemeter app gives you fast and easy access to everything you need to know about the grass growing on your farm. The Platemeter app was developed to use with the G1000 Platemeter and easily connects to your Platemeter each time you use it. Or you can upgrade your old Platemeter to a G1000 by purchasing a new counter.